Beautiful friends, I hope this post deposits hope and seeds of faith in your hearts. God loves you with a deep, pure, and everlasting love. God’s love is not based on performance or merit. He loves us as we are; while sinners, while broken, while messed up, while self righteous and prideful, while scornful, while we are rejecting Him or trying to use Him, while immature…God is love. 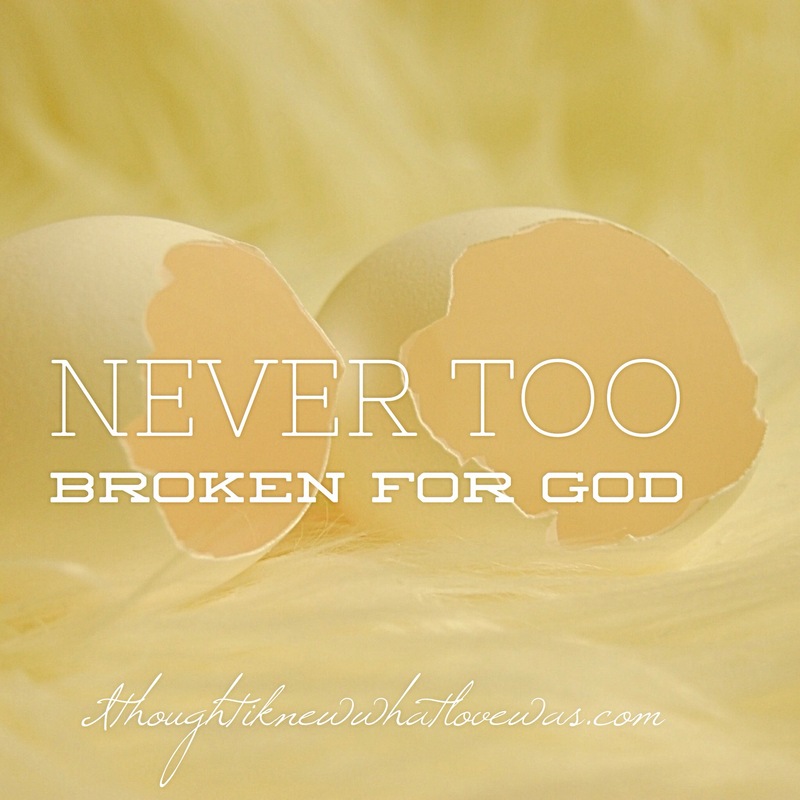 You and I are never so broken or too broken for God. As we receive His love, we are transformed from the inside out. We are made whole through relationship with Him. One of my favorite passages is from Isaiah 61. I taught on this passage Sunday. Why did Jesus come to earth? It wasn’t simply for our forgiveness of sins and to get us into heaven. God longs to get heaven into us so we are restored, renewed, and full of His glory. He came so we could have life, and life abundantly (John 10:10). What if your life right now is a mess? What if you hurt every day? What if those around you just want you fixed so they don’t have to deal with your brokenness, depression, grief, heartache, or pain? What if people would rather ignore you than walk with you? What if grief is your bedfellow? Well, dear hearts, I know Someone who is close to the broken hearted. No matter the pain, sorrow, grief, or sin…God moves towards not away from the hurting and sinful. I’ve been there. Maybe not in the same exact place, yet I understand suffering and prolonged suffering. I recall being sick in my body, losing my hair, being mocked for losing my hair, told by relatives I wasn’t truly sick or I could do more than I could, and I recall hurting day after day-night after night. Some nights the pain was so bad I’d cry out for numbness, to feel nothing. I know what it’s like to hurt beyond the capacity to pray. There was no one there but me and God in some dark moments. I can say with confidence God didn’t turn away. He didn’t remove all pain. He did walk me through the pain that wasn’t immediately healed. There was excruciating pain and agony in seasons. God was there. He never left. He never said, “You’re too sick to heal. You’re too broken to deal with right now or ever. You’re a mess! You’re not worth my time.” I have had people in Church and family/”friends” do those things, God never has. God stayed right with me in hospital rooms. God kept me from dying. God spoke words of encouragement when others were super discouraging. Even when I couldn’t hear His voice, He didn’t let me die. He was and is a miracle worker. If you’re hurting today, that doesn’t mean your condition is permanent. I never thought I’d have lasting joy or relief from chronic pain. I spent many years waiting for the next bad thing to happen. Yet God gave me joy for mourning. If you’re severely broken or struggling, God isn’t looking down His nose at you in disdain or disgust or trying to run from you. He’s longing to heal and restore. He reaches down low and lifts up the broken. No matter what is happening in you or around you, God longs to be an Advocate, Comforter, Lover of your soul, and Healer for you. You are SO deeply loved (John 3:16). Please don’t run from God, run towards Him! No one loves you more! Papa God, I ask for the souls of everyone reading this to prosper and be in good health. I ask for healing of the mind, body, soul…restoration and renewal. I ask for freedom from shame, excessive hurt, comfort for grief, and freedom from all sickness, disease, depression, hopelessness, despair, infirmity, and pain. In Jesus powerful name, amen. Love to you all…you’re continually in my prayers. Yes indeed. Such a great word, Erin! Blessings & abounding love to you Kathy! You are deeply loved. He never gives up on us. You are so loved. Don’t give up. God loves you! Thanks for stopping by!!! You are loved.